I began this painting in 2005… and didn’t finish it until 2010! Holy painter’s block! I was about 90% finished when I realized my version of the painting was out-of-date, as it didn’t include the green monster seating. I got so frustrated, I packed the painting away… for five years! Anyway, thankfully, I was able to finish it, and pay homage to Fenway Park, home of Boston’s most beloved Red Sox. Beyond the usual whimsification, I also took some artistic liberties with the advertising, choosing to include the Make a Wish Foundation and the Boston Children’s museum over the corporate ads that are a reality. I couldn’t bear to leave out Dunkin’ Donuts, though! You can’t walk 3 blocks in this city without bumping into one (and ordering a medium iced coffee, 2 creams, 2 sugars, shot of coconut). Just sayin’. 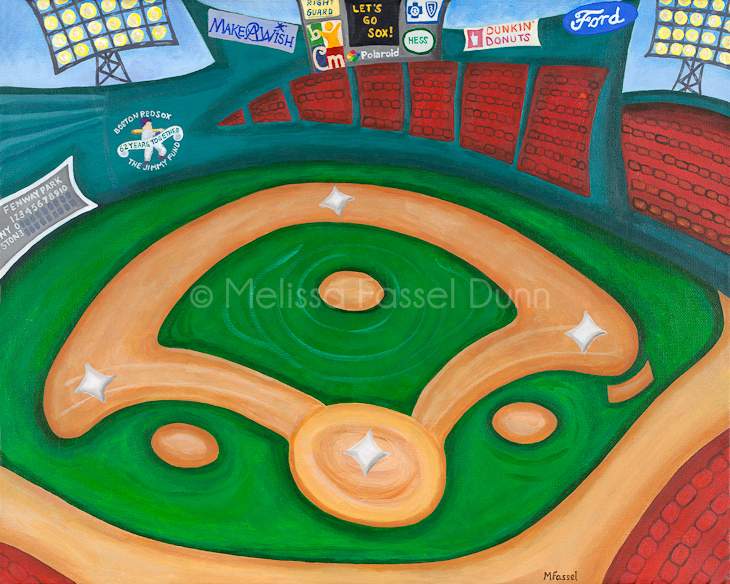 Home of Boston’s beloved Red Sox, this painting would go perfectly in a family room, man cave, or child’s bedroom.